When it comes to replacing missing or damaged teeth the best solution available is to receive a dental implant. Dental implants, as opposed to other methods of replacing missing teeth, are implanted directly into the jawbone, creating an artificial root which is intended to be as strong and stable as a natural tooth root. This implanted root is most commonly made with titanium and surgically placed into the jawbone. Within 3 to 6 months the titanium root becomes osseointegrated with the jawbone. Only when this happens is the implant procedure complete and ready to be fitted with a prosthetic tooth (crown) for a natural look and feel like none other. The term dental implant technically only refers to the implanted titanium post aspect of the operation. 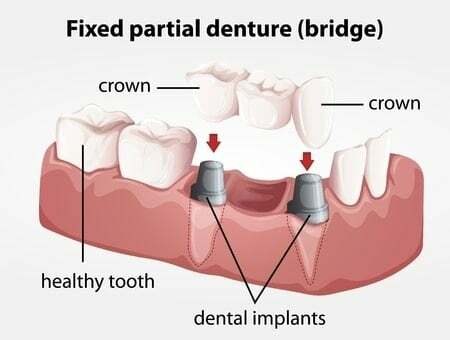 These implants can be used to support an individual crown, or a prosthetic bridge which has several artificial teeth on it to replace more than one damaged tooth. For example, as little as 4 implants can be used to replace an entire arch of missing teeth by attaching a permanent denture to 4 titanium posts that are implanted into the jawbone. Preservation of Jawbone Structure – when teeth fall out, the area of the jawbone that supported those teeth has no reason to maintain its strength and thus begins to deteriorate. By using dental implants to replace these teeth, the jawbone is preserved to support the implants, keeping your facial structure intact. Higher Comfort Level – because dental implants are rooted directly into your jawbone, they feel just like real teeth when chewing and speaking. Dentures, on the other hand, are nowhere near as stable, often slipping out of place making it very uncomfortable to chew and sometimes embarrassing to speak. Superior Oral Health – dentures or removable bridges create many gaps between your teeth and gum line which are easy places for plaque and bacteria to accumulate. Having this buildup of plaque and a diminishing jawbone structure can quickly deteriorate your oral health, something that will be significantly reduced with dental implants.